From the 1st to the 3rd September I contributed to the second ‘Future of Places’ global conference, hosted in Buenos Aires by the Ax:On Johnson Foundation with support from UN-Habitat. The focus of the conference was debating the role of the streets as public spaces and drivers of urban prosperity. Find below a summary of the presentation, its key message and access to my presentation slides. The full paper will be published in the context of a dedicated ‘Future of Places’ / UN-Habitat paper collection. Global mega-events such as the Olympic Games have become a key aspiration of cities trying to position themselves as world capitals. The Olympic Games, in particular, has evolved into a highly lucrative enterprise which is no longer sought mainly for its role as a platform to showcase elite sport, but due to the expectation that it can be a catalyst for urban transformation resulting in considerable economic, social, cultural and environmental legacies for the host city. However, by definition, a mega-event is first and foremost a ‘media event’, highly dependent on global media imperatives both to secure revenues and ensure worldwide dissemination. This has resulted in the most sophisticated framework for media operations, involving thousands of accredited media whose needs take precedence over other regular city-living expectations while the main event is on: from main road closures to the radical transformation – often involving no-open access – of the city’s most iconic public spaces. 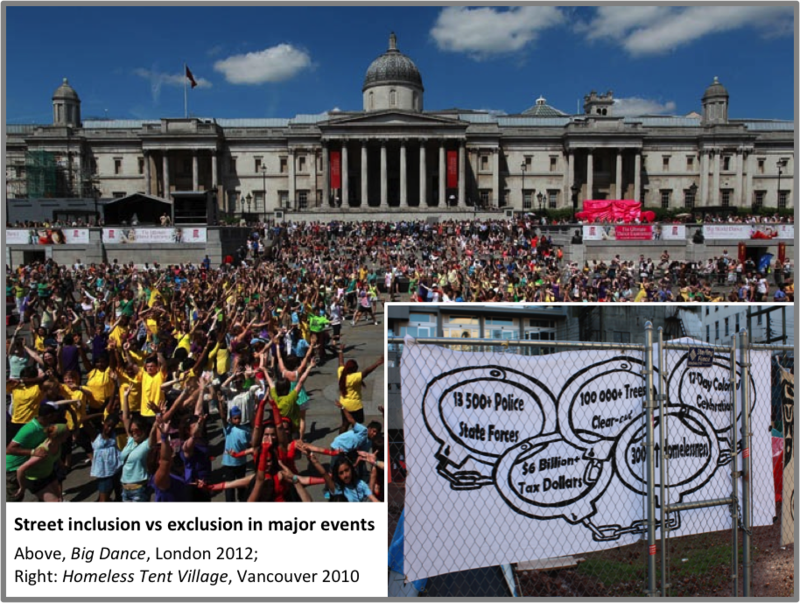 This paper argues that, despite the fact that the large majority of a mega-event audience only experiences it through the media, the event will fail to provide sustainable local legacies if its mediated dimension is not properly complemented by a festive and widely-accessible use of the street enabling localised ‘lived experiences’ to coexist with the better known mediated experience. The paper offers examples from Games editions since Los Angeles 1984. The defining role played by the street in each of these Games (be it as an inviting or out-of-limits space) explains the high degree of attachment generated by the Barcelona 1992, Sydney 2000– which have also resulted in widely acclaimed city legacies – as opposed to the urban tensions surrounding Beijing 2008 or Vancouver 2010. The paper concludes with a reflection on the importance of ‘locality’ versus potentially ‘placeless’ host environments and highlights the importance of ensuring that event-related urban policy and practices become more sensitive and protective of the needs of respective local environments as the only way forward to make mega-events sustainable. Global mega-events such as the Olympic Games have a worldwide impact thanks to their positioning as media-events gathering multi-billion audiences across all continents. However, such events will fail to provide sustainable local legacies if their mediated dimension is not complemented by a festive use of the street enabling localised ‘lived experiences’ to coexist with the internationally mediated experience.